In a movie I watched not long ago a man from NYC was visiting Savannah and before he goes to sleep he turned on a tape recording of car-big city noises-- these apparently made him feel at home. If you open the windows this time of year where we live in Oklahoma in the evening the frogs singing are a beautiful chorus... They sing through most of the night. We have also had the Midnight mockingbird return. Seriously it's midnight between 12-3am (don't ask how I know). 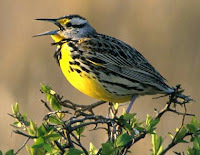 This singer, they say it is the males who sing at night, had 14 songs he sings. I've counted them three times... It's not as hard as it sounds. These sounds make a difference in the world. You can hear them and focus on them and enjoy them. We also have a train or two that come through at night. The one from the south is full as you can hear the difference in the way the train cars sound as they go by. I'm really not sure what they are hauling but really does it matter? Somehow this world has sounds that we miss because the sounds of engines and people are everywhere. Here in the Middle (Oklahoma) there is a lot of quiet. And it is delightful. Enjoy the quiet. Enjoy the pauses in your life. What nature songs make you feel at home...? I don't know not really what is ahead. That's not a silly thought or depressing...it just is. But I don't know if that will work out..
And faith says... that IS ok.
Because we already have all we need and even more..
for the maybes of tomorrow in the storage units of life.. Anyway driving along thinking about lots of things bursting into whatever thing I might have been mulling over.... came this song... reminding me of the world there... just there... that I was driving by. And that is a really good reminder that we need to be where we are. Present to the present tense of our lives. Yesterday is past...tomorrow is only a dream... we have now. Paul wrote in all these things I shall be content. not surrender... but rather living into that place or thing. I was watching PBS Dickens: Old Curiosity Shop. I know somewhere I must have read this but didn't remember well enough..It left me crying. I'm ok now really but it was one of those things that grief does....you think you are ok and 'thru' it and then boom you are in it again. Here is the line that got me. I turned to the last two chapters and found the line in Chapter 72 Here friends is the fullness of the quote which makes it better. Oh! it is hard to take to heart the lesson that such deaths will teach, but let no man reject it, for it is one that all must learn, and is a mighty, universal Truth. When Death strikes down the innocent and young, for every fragile form from which he lets the panting spirit free, a hundred virtues rise, in shapes of mercy, charity, and love, to walk the world, and bless it. Of every tear that sorrowing mortals shed on such green graves, some good is born, some gentler nature comes. In the Destroyer's steps there spring up bright creations that defy his power, and his dark path becomes a way of light to Heaven.